Key questions in palaeontology concern the quality of the fossil record. Is the sample of known fossils enough to justify detailed studies of the history of life? Do palaeontologists know only 1% of all the species that ever lived, or 10%, or 70%? Life originated 3500 million years ago, and countless millions of species have come and gone since then. Today there may be 10-30 million species on Earth, and no-one can begin to estimate how many have become extinct in the past. Fig. 2.10 The pattern of evolution of the vertebrates, showing the relative diversity of the major groups through time and mass extinction events (marked with stars). This is a 'spindle diagram', in which the vertical axis represents time, and the horizontal axis represents the diversity of the group. In this case, the horizontal dimension is proportional to the number of families of each group, based on data compiled by various authors in Benton (1993a). Dashed lines indicate hypothesized relationships. 'Agnatha' includes conodonts (see Chapter 3). Fig. 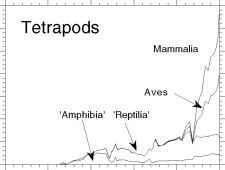 2.11 The diversification of fishes (a) and tetrapods (b), based on the numbers of families of each group through time (data from chapters in Benton, 1993a). Mass extinction events are highlighted. each of the groups, and their relative diversity through time. 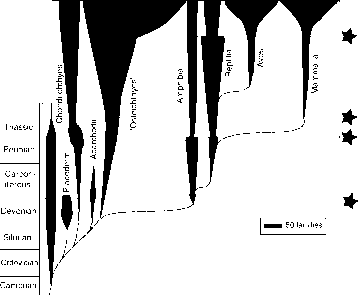 The information is shown in two ways, as a 'spindle diagram' (Figure 2.10), and as a pair of diversity plots (Figure 2.11) that highlight times of rapid diversification (increases in numbers) and times of extinction (declines in numbers). Major extinction events are highlighted. But do these diagrams in any way approximate to the truth? Could it be that there are so many gaps in the fossil record that they are entirely misleading? This critical point was tested by Norell and Novacek (1992). They reasoned that if they compared independent evi dence for the history of life, they might find whether our knowledge of the fossil record is hopelessly inadequate, or whether independent data sets tell the same story. Norell and Novacek compared geological evidence about the order of appearance of different groups of vertebrates in the rocks with evidence from cladograms about the order of nodes. In most cases, they found a good match of age and clade order. Indeed, it turns out that the fossil record of land vertebrates is as good as that of echinoderms, a group that is usually assumed to have a good fossil record (Benton and Simms, 1995). Fishes and tetrapods (literally 'four feet'), the land vertebrates, have equally good fossil records (Benton and Hitchin, 1996). At family level, the fossil record does not deteriorate the further back in time one goes (Benton et al.,2000c). Another observation confirms that palaeontologi-cal knowledge is not completely inadequate: dramatically unexpected fossils are hardly ever found. If the known fossil record were very incomplete, many dramatic new finds would be made, dinosaur fossils in the Permian or Tertiary, human fossils in the Miocene, shark fossils in the Precambrian. This does not happen. New finds are expected. For example, in 1985, the oldest monotreme mammal fossil came to light in the Lower Cretaceous of Australia (Archer et al., 1985). This fossil extended the known range of monotremes backwards in time by more than 100 million years, but it merely filled a gap that was predicted from the cladogram. New finds improve our knowledge, but they rarely revolutionize it. Fossil discoveries since 1967 have plugged many gaps, and the quality of matching between fossil dates and phylogenies has improved by 5% (Benton and Storrs, 1994). Perhaps palaeontologists can rest easy, and freely integrate their information about the life of the past with their studies ofmodern organisms.